Once a Bucket of Cleaning, this device was used to quickly clean items using prestidigitation…at least until it was discovered the bucket was swallowing socks. Unfortunately, this was part of a master plan by Emperor Hempleduke who has spent centuries stealing just one sock every time this bucket was used until he amassed an army. 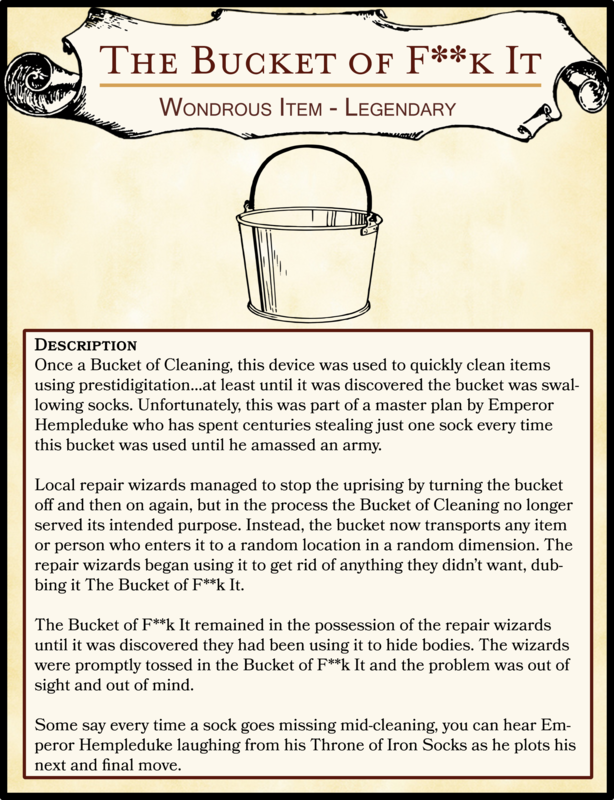 Local repair wizards managed to stop the uprising by turning the bucket off and then on again, but in the process the Bucket of Cleaning no longer served its intended purpose. Instead, the bucket now transports any item or person who enters it to a random location in a random dimension. The repair wizards began using it to get rid of anything they didn’t want, dubbing it The Bucket of F**k It. The Bucket of F**k It remained in the possession of the repair wizards until it was discovered they had been using it to hide bodies. The wizards were promptly tossed in the Bucket of F**k It and the problem was out of sight and out of mind. Some say every time a sock goes missing mid-cleaning, you can hear Emperor Hempleduke laughing from his Throne of Iron Socks as he plots his next and final move.